Grandmaster Jhoon Rhee, the man known as the "father of American Taekwondo," died Monday after a long illness. He was 86. ARLINGTON, Va. (AP) — Grandmaster Jhoon Rhee, the man known as the "father of American Taekwondo," died Monday after a long illness. He was 86. His son, Chun Rhee, said his father died in hospice care in Arlington, Virginia, a suburb of the nation's capital. Jhoon Rhee was a 10th-degree black belt credited with popularizing taekwondo in the United States, especially around the nation's capital, after emigrating from Korea in the 1950s. 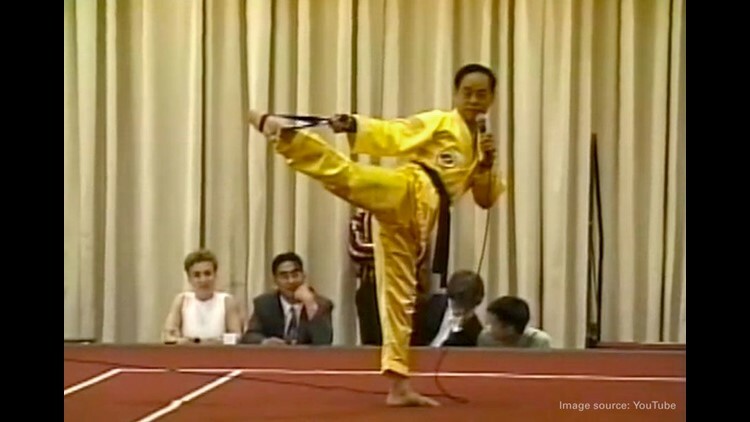 He opened his first taekwondo school in Washington, D.C., in 1962. By the 1980s, Rhee had 11 schools in the Washington area. Rhee became friends with legendary martial artist and actor Bruce Lee and appeared in a 1973 movie titled "When Taekwondo Strikes." He also befriended boxer Muhammad Ali. Chun Rhee said that during a 1976 sports awards ceremony, his father jokingly challenged Ali and basketball legend Wilt Chamberlain to a fight to settle which one of them was "the greatest" athlete. "Martial arts was a way of life for him," Chun Rhee said. Chun Rhee said funeral arrangements have not yet been finalized. He said information about a memorial service will be posted later this week.